2015 has been quite a year for UK fundraisers, and as it draws to a close I hope you are all looking forward to a very Happy Christmas. As you know, every year I run a Christmas quiz, raising money for SOFII. This year it’s a word-search – what could be simpler? Simply look in the tree below and find as many of the bands and artists that have had a UK Christmas no 1 hit (they might be written forwards, backwards, up, down or diagonally). There are 11 in total, plus another band that would have had one but for BandAid (there’s a clue!). Can you spot the 12 bands and artists? For every entry I receive I will donate £1 to SOFII*. And at midday on Christmas Eve, I will draw, at random, one entry from those that have got them all right and they will win a £50 donation for the charity of their choice. 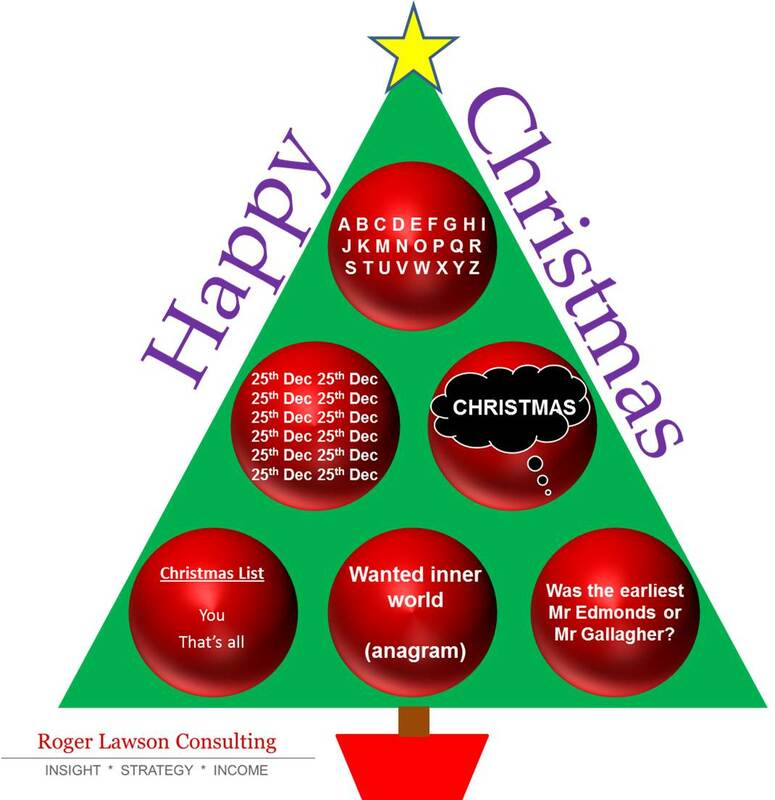 Just email Christmas@RogerLawsonConsulting.com with your guesses. I hope you enjoy the challenge – good luck! And please do pass this on to colleagues and friends to increase their chances of winning too. With very best wishes for Christmas and for 2016. PS For those of you that don’t get all 12, I will blog the answers on Christmas Eve. * Why SOFII? Because at these times when we all need to be more creative in the way we inspire donors, it provides the most fantastic resource. For free! It’s nearly Christmas, and the draw has been made. Congratulations to George Overton of the Pilgrimage Trust who was the first all correct entry out of the hat. He wins £50 for his favourite charity. And thanks also to all the other entries – £200 is on it’s way to SOFII. Noel – there’s no L in there. Geddit? 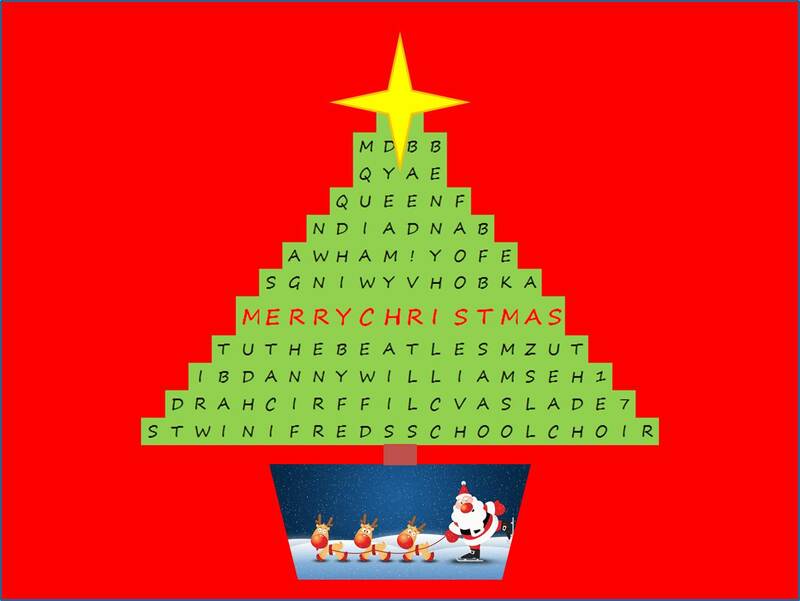 For those who guessed ‘Christmas Alphabet’ I can see where you were coming from, but it wasn’t quite the whole alphabet. 12 days of Christmas. Again, I liked a couple of entries that suggested ‘I Wish it Could be Christmas Everyday’ if only because it’s a great song! All that remains is to wish you all a very happy Christmas and a successful and healthy 2015. I’ll be planning next year’s quiz! I hope 2014 has been successful and happy and that you are looking forward to 2015. I’d like to wish you and yours a very happy Christmas and New Year. You may know that every year I run a little Christmas Quiz with my Christmas card and best wishes. Apparently I made it a little difficult last year so I hope this year’s is a little easier. All you have to do is work out the clues which loosely lead to six Christmas songs. When you think you know the answers, email them to me. For every entry I will donate £1 to SOFII (because it is a brilliant resource for fundraisers – up to £200). In addition, on Christmas Eve I will draw one name out of a hat from those that get all six right and they will win £50 to donate to a charity of their choice. So please do pass this on to your colleagues and friends. Enjoy the puzzle and good luck! And make sure you’re signed up to this blog to be the first to have the answers delivered to your in-box in time for Christmas. With very best wishes for a very merry Christmas and a happy and successful new year. So Christmas is over. And if you spent it wondering what the answers were for the challenge then apologies. As one of 10’s of thousands of people who had 48 hours with no power and no phone signal until Christmas Day evening, I couldn’t get the answers out. But I hope you all had a fantastic day, and now I can put you out of your misery. OK, the easy one. Everyone got this. I couldn’t find the lyrics anywhere online so I listened to it over and over on Youtube writing down the lyrics as it played. A horrible way to spend an afternoon. Feed the World / Do They Know It’s Christmas? How can a fundraiser hate the song that changed the way music can raise money? One, it kept Wham! (Last Christmas) off the number one spot. Two, I just don’t like it! A classic, but I’ve heard it too many times. And what’s with the whistling in the middle? Last year I put this in my top 10 songs as, although it’s sung by Mariah Carey, it’s a great pop song. This year it’s in my worst 10 as, although it’s a great pop song, it’s sung by Mariah Carey! Harsh, but true. This also made my favourite 10 last year. As I put my worst 10 list together a few weeks ago, I decided I didn’t like it. And a few weeks later I think I do. I can’t make up my mind, but well done on everyone getting it right! The Snowman. It’s beautiful, but I’m afraid I just never really got it. The tricky one. My teenage daughter, with the help of Google, was the only person to get this right. Mel Smith was a fantastic comedian, and sadly died too young this year. I’m sorry to say this wasn’t his finest hour. Another charity record (Comic Relief) record condemned! Funky pie, anyone? Actually, in researching this list I discovered many truly dreadful songs that I’d never even heard of before: John Denver with the wise words, “Please Daddy (Don’t get drunk this Christmas)”; Elmo and Patsy singing “Granny Got Run Over by a Reindeer” and other contributions by The Cheeky Girls, Crazy Frog and Alvin and the Chipmunks. They almost make Mr Blobby sound OK. Thank you so much for everyone who entered, and for all the comments and fun that was had. A donation for £200 is on its way to Sofii. And massive congratulations to everyone who got 8 out of 10 as you had the highest scores (except my daughter who spent far too long on it and cheated, so is disqualified!) The first to be selected at random from these people was Duncan Batty, Head of Fundraising & Development at Sheffield Hospitals Charity who now has £50 to give to the charity of his choice. So that’s it for another year. But don’t worry, I’m already thinking of something fiendish for Christmas 2014! Once again I’m not sending Christmas cards – instead I am donating money to SOFII. And once again, how much I give will be up to you. Yes, my Christmas Challenge is back again this year! You may recall that last year I asked you to work out my favourite 10 Christmas songs of all time. This year, can you work out the worst 10 Christmas songs ever? 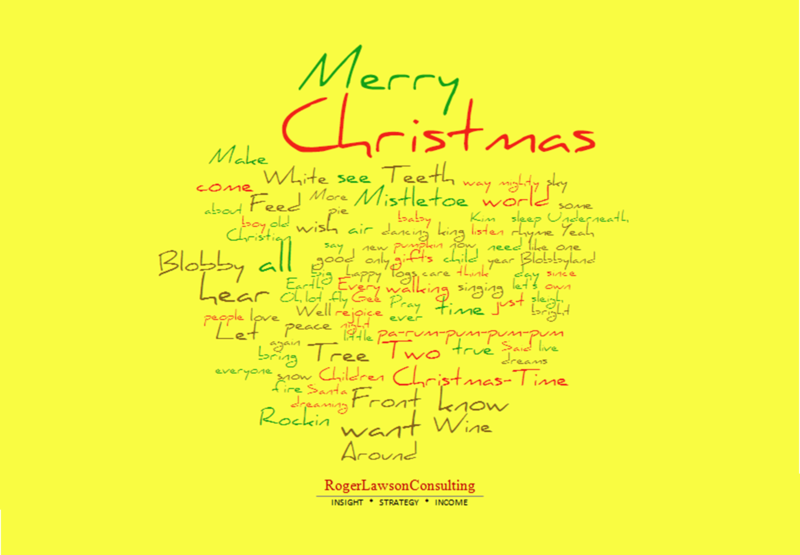 My card (above – click on it to see a larger version) is a word cloud of the lyrics from the 10 songs that I think are the worst Christmas songs ever recorded. If you think you can work out which 10 I have selected, email me your guesses. For every entry I receive I will donate £1 to SOFII*. And at midday on Christmas Eve I will draw, at random, one entry from those that have got all 10 right (or those nearest if, like last year, no-one manages it) and they will win a £50 donation for the charity of their choice. Good luck with the challenge. And please do pass this on to colleagues and friends to increase their chances of winning too. With very best wishes for Christmas and the new year. PS For those of you that don’t get all 10, I will blog the answers on Christmas Eve. * I have chosen SOFII again this year as they provide an invaluable resource to all us fundraisers. Our job is to inspire donors and SOFII makes this a little easier for all of us. Much as I love them, I need to limit my donation to them to £200, but please do enter to make sure we get there.